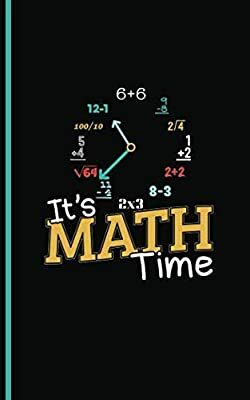 It's Math Time mathematician pun quote with a clock based on simple Grade 1 thu 8 formula equation symbols. Motivational! Inspirational! Use as a writer's journal, office exchange party gift, or for the desk of any academic University or High School student. Works best for elementary school math teacher appreciation gift, number geek kid student, computer programmer or math fan. Record your travel memories, training thought quotes, lesson reminders, or success stories.